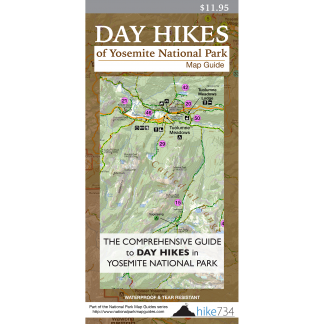 This long loop explores the floor of Yosemite Valley visiting its popular features, open meadows, and areas of solitude. Start at the Lower Yosemite Fall shuttle stop (#6), and visit the base of these amazing falls (see Lower Yosemite Fall) before heading west along the Valley Loop Trail. Follow the Valley Loop Trail through the forest past Camp 4. 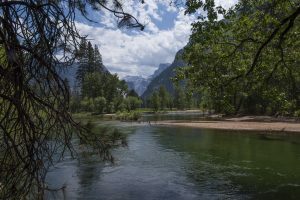 The trail follows along the river and open meadows that the valley is famous for, skirts the base of the massive face of El Capitan, and continues through forest before crossing over the Merced River on the Pohono Bridge. The trail once again follows along the Merced River. It gets busier again as you get closer to Bridalveil Fall which is a short, worthwhile side trip to see this tall, elegant waterfall drop into the valley (see Bridalveil Fall). The trail continues through the forest with occasional views of El Capitan then Yosemite Falls. Once at Yosemite Valley Chapel, cross through the parking lot and take a right to Sentinel Bridge. Cross over the bridge, with its wonderful view of Half Dome, and then take the path back to the Lower Yosemite Fall shuttle stop to complete the loop.